With the right commercial pressure washing Colorado Springs tools, cleaning surfaces will never have to be tedious ever again. So, it’s vital to choose the right equipment to help you remove dirt and grime that has stuck to the floor or walls for a long time. The wrong choice of pressure nozzle spells the difference between a good or bad pressure washing job. If you’re washing a car, there’s a huge possibility that the paint would peel off with the wrong nozzle. If you’re washing a driveway, the water could punch through the mortar. This is because the nozzle you choose will indicate the pressure a washer exerts when pushing water out of the equipment. What if you choose one that ejects a strong pressure? Sends a blast of water directly to the surface. It’s rarely used because it only cleans a small surface area at a time. It sprays water at a wide 15-degree angle, covering a wider surface than the red-tip nozzle would. Best for pressure washing Colorado Springs specialists recommend to lift dirt and clean surfaces. Providing the most gentle spray, it is often used to clean windows. Use primarily for soaping surfaces. This particular pressure washer nozzle combines the blasting power of a red-tip nozzle and the lifting ability of the green-tip nozzle. Rotation adds in the pulsing action. Spews out a water jet at 1,800 to 3,000 rpm. Use to remove hard and tough grease, oil stains, etc. 2) 15-degree, yellow, stripping - Cleans dried oil, mud, and grease stains that are tough to remove. 3) 25-degree, green, lifting - Cleans tiles, bathroom, kitchen, walkway, and cars. 4) 40-degree, white, spraying - Removes dirt from floor, car, motorbike, and other delicate stuff. 6) Turbo/rotary nozzle - Cleans floors (tile or mosaic), patio, roof, etc. Now that you know what each type of nozzle is capable of, choosing the right one should be easy. Just to be safe, however, start with a nozzle that has a wider angle and test the pressure on a small surface area. This way, you’re sure that you made the right choice. Remember to keep your distance as well. Need help with your commercial pressure washing needs? 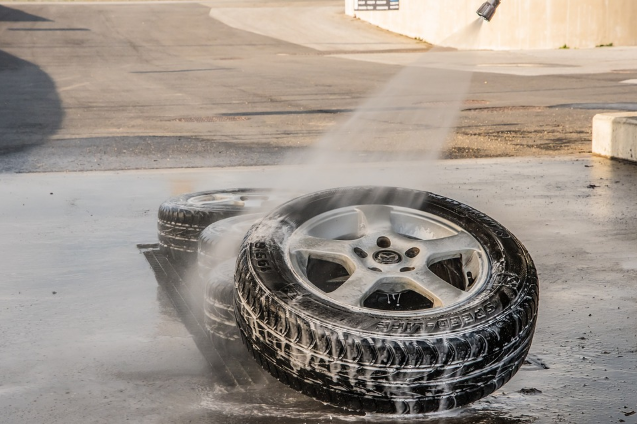 Get in touch with PSI Systems Inc. We not only offer financing and pressure washer trade-in Colorado clients trust but also sell pressure washers, parts, and accessories, including nozzles. Don’t hesitate to contact us for more information about our products and services.